Two undefeated Kazakh pro boxers win big in U.S.
ASTANA. 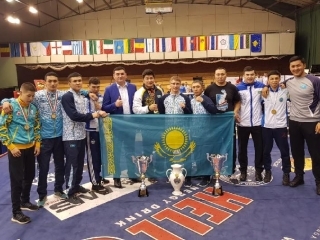 KAZINFORM - Kazakhstani pro boxers Meiirim Nursultanov and Madiyar Ashkeyev have celebrated their wins at the evening of boxing in Santa Ynez, California on Friday, Kazinform has learnt from SPORTINFORM. Meiirim Nursultanov (10-0, 8 KOs) knocked out Mexican Ramon Aguinaga in the second round. As for Madiyar Ashkeyev (11-0, 6 KOs), he defeated Puerto Rican Luis Hernandez by unanimous decision.